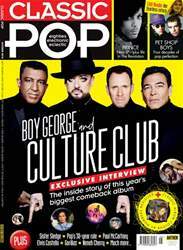 Issue 45 of Classic Pop magazine is on sale now! In the latest issue our cover stars are Boy George and Culture Club – we grab an in-depth interview with the iconic singer and guitarist Roy Hay as the band return with their first studio album in almost 20 years. We also find out what life was like inside Prince's backing group The Revolution from band member Lisa Coleman and hear from the Purple One's archivist Michael Howe about further unreleased material from the legendary singer. Need a buyer's guide to Pet Shop Boys? We look at the duo's complete career in our Lowdown feature. Former Fairground Attraction frontwoman Eddi Reader tells us all about her new album Cavalier and we also meet Sister Sledge who look back on their disco heyday. New albums from Paul McCartney, Elvis Costello, Blancmange and Neneh Cherry get the once-over alongside reissues by Yazoo, Pixies, Cocteau Twins, David Sylvian and much more. We also review live shows including Gabrielle, Simple Minds and The Proclaimers. Enjoy the issue! CAN YOU BELIEVE YOUR EARS?